Liquid Health™ Vitamin D3 Supplement Drops make daily supplementation simple. • Each milliliter contains 1000 IU of Vitamin D3 suspended in ActivAloe® pure aloe vera juice. • Liquid Health™ Vitamin D3 drops can easily be added to liquids and are ideal for children and those who have difficulty swallowing pills. 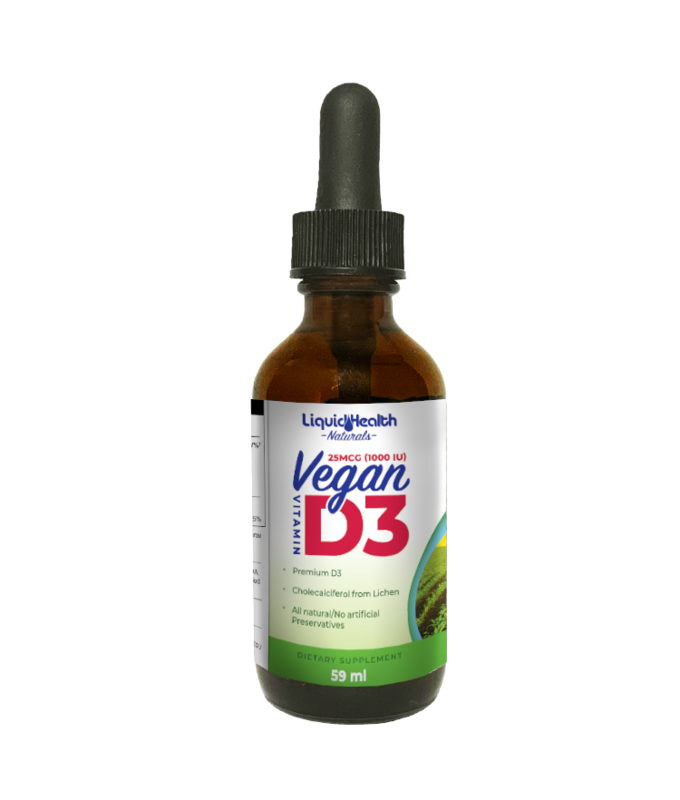 D3 has Higher Bioavailibility than D2—Several studies show that the natural form of liquid Vitamin D3 outperforms D2 in long-term Vitamin D levels and bioavailability. This is particularly true as we age and our ability to metabolize D2 is dramatically reduced. Vitamin D3 metabolism remains unaffected by age. Healthy Bones and More—Once, Vitamin D was primarily known as a bone builder because it works with calcium to help keep our bones strong, but emerging research suggests vitamin D may be far more versatile, offering an array of wellness benefits including immune support, cardiovascular protection, and healthy aging. Winter Months and Sunlight—Our bodies can produce vitamin D from the sun, but you can’t always count on it to supply what your body needs—especially during the winter or when you are wearing sunscreen. In some climates, the winter sun is not useful for vitamin D synthesis for up to 6 months of the year. Even in sunny climates such as Florida, studies have shown that about 40% of the elderly population are vitamin D deficient. Other Ingredients: ACTIValoe® aloe vera juice, Vegetable glycerin (USP), Natural flavoring, Potassium sorbate & Potassium benzoate (to preserve freshness). *ActivAloe® is a registered trademark of Aloecorp, Inc. CONTAINS NO SUGAR, STARCH, SALT, WHEAT, GLUTEN, YEAST, MILK, OR SOY DERIVATIVES.